One of the basic needs of people is to be understood. When you listen to what people say you learn about them and better understand them. Being listened to makes people feel respected, valued, affirmed, loved, appreciated -- understood. Failure to listen comes across as indifference. If people don't feel you care, they will either clam up or stay superficial. Good listening is active, not passive. Be sure to express accurate empathy by paraphrasing or summarizing what the person has said. At times use open-ended questions for clarification or to draw the person out further. 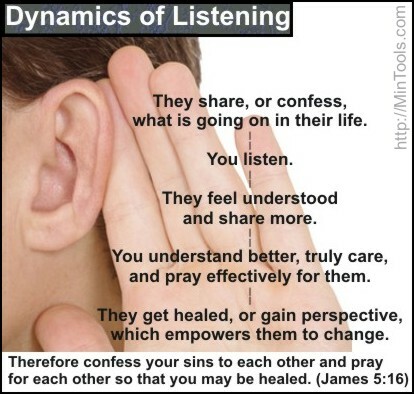 This kind of listening opens the doors for the fulfillment of James 5:16 that begins with the person confessing or sharing what is going on in their lives with you and results in healing and change. Listening is part of the burden bearing process (Gal. 6:2). How will you bear one another's burdens until you learn what they are? How will you learn if you don't listen? Order the People Helping Ministry Manual for some thoughts on why it is hard to listen and what to do about what you hear. In addition, you will find listening likened to tracking with the person. Putting Yourself in Someone Else's Shoes - Why? Putting Yourself in Someone Else's Shoes - How?